Lily & Spice is a rather forthright take on lily, miles away from the embellished approach of Serge Lutens Un Lys or Donna Karan Gold. It opens on lily accented with subdued green notes, but almost from the start, all of the hard edges have been softened; it isn't likely to strike anyone, as Gold apparently did, as overly sharp. If you pay attention, you will find the saffron and hints of clove, but the fragrance isn't more than mildly spicy overall, in fact, I'd say it is not quite as spicy (or as sweet) as a real lily. 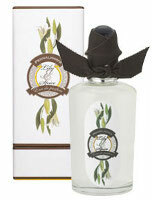 There is nothing of the lushness of Un Lys, just a very pretty, very feminine lily, more fresh than not. The dry down adds a touch of earthiness, but no more — the patchouli is done with an extremely light hand — over a musky woods base; after about an hour, there is the vaguest little dusting of powder. The powder intensifies as it continues to develop, but it never overwhelms the fragrance. Lily & Spice is nicely done and very wearable, but personally I don't find it as captivating as Un Lys or Gold. If either of those fragrances were too much for you, Lily & Spice might be more to your taste. Lily & Spice is an Eau de Parfum, and the lasting power is good. It is sold in 50 and 100 ml bottles; a matching candle is also available. For buying information, see the listing for Penhaligon's under Perfume Houses. Hmmm….I'm not moved by your description, darling. Tis ok, not everyone has to be a lily lover, and I'm not especially moved by this one myself. Hugs to you too! I've only tried a few Penhaligons. Somehow they don't end up enchanting me, there's something sort of watery about them — and it's not like I'm opposed to old-fashioned scents either. I do like Malabah, but not “love.” If only the juice lived up to the bottles. P.S.–I have not tried Caron Alpona. Why do you think I would like it, since I can't seem to find one dern Caron that I love, save for the wonderfully girly-girl Bellodgia? No reason except that it was the first one I really loved, LOL…not a very good reason, I guess, since we don't always love the same things. But it doesn't have the same feel to me as the other classic Carons…it doesn't have that strong, dark, Caronish undertone. Most of us perfumistas bristle at the idea of scents being categorized as “old woman”, LOL– esp. those like me who could qualify as such. But I do get the idea, and this one doesn't strike me that way. No idea if it has aldehydes, but you needn't order it unsniffed, you can get a sample from Aedes. being old and smelling old are two different things my mom wearing chanel no5 smells “old”. this are aldehydes which remind me of unaired furs of an 80year old lady. i know this is a crazy desciption. don't bristle, it has been my grandma smelling like this trauma. thank you though! and i did not mean to offend any of us ladies, not even the elder ones over 80.